Cerritos Therapist: Lissett Pisfil - Therapist 90703. Send A Message To Lissett. 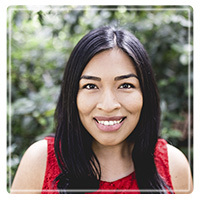 I am a bilingual Spanish speaking Registered Associate Marriage and Family Therapist dedicated to providing a safe space for people to openly share their thoughts and feelings. People may be hesitant or have negative feelings about making the decision to go to therapy. I want to reassure you that I will approach our sessions with empathy, warmth, and a nonjudgmental perspective as you take steps toward seeking help. My desire is for you to feel empowered and experience growth and healing in our time together. My preferred therapeutic approach is utilizing Cognitive Behavioral Therapy. So, I work primarily from that model. I utilize evidence-based cognitive behavioral interventions and adjust them to fit my clients. These psychological interventions are designed to process situations and track negative patterns in order to encourage steps towards change. As a Christian therapist, I am prepared to integrate my training in psychology with my spiritual background as a Christian to help you accomplish your goals. I am able to utilize scripture and prayer in addition to the standard therapeutic interventions but only if you desire to incorporate a spiritual perspective to our sessions. I acquired a Bachelor of Arts degree in Psychology and Social Behavior at the University of California, Irvine. I subsequently completed the Marriage and Family Therapy program at California State University, Long Beach (Cal State Long Beach) and obtained a Master of Science degree in Counseling. I have been practicing Marriage and Family Therapy under the supervision of Rebecca L Schwarz, LMFT since 2014. I am currently working towards my license as a Marriage and Family Therapist at Schwarz and Associates. My previous experience includes working at the community clinic at Cal State Long Beach during my practicum as a graduate student. Additionally, I was also practicing therapy at Turning Point Center for Families in Santa Ana, a non-profit organization that provides affordable therapeutic counseling services. We can experience problems in our lives that leave us feeling defeated and alone. Making the decision to seek help is courageous and I would love to be able to support you as you work towards achieving your goals.